Find and recall your favorite stations easier with the i10's automatic scanning and channel storage functions. And the automatic scanning function is also work for music and stations. Storage supported: When encountering a channel you would like, store it and no more missing and fishing for it. High gain antenna: provides clear, great reception to maintain a good FM listening. Use i10 as an alarm clock instead of smart phone to reduce radiation! InstaBox i10 includes a sleek, mini remote control, giving you ease of access and convenience. It is simple to use, all features can be access by one button, besides, there is a "like" button (heart-shape) to store the songs you like. It has a 3 meter (120") of working range. DC power supply, USB charging; the remote control is button battery. ♫ ♫ Convenient Remote Control : No more struggling against lazy sofa--the best choice for couch potato! 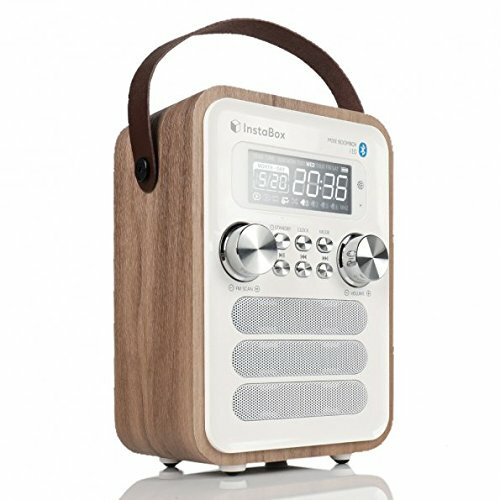 Tiny but all-featured, you can easily change the songs, channel, station, volume, mode of the speaker and record your favorite songs. One-button way allows you to play it very easy and quickly, no more difficult operation! View More In Compact Radios & Stereos. If you have any questions about this product by InstaBox, contact us by completing and submitting the form below. If you are looking for a specif part number, please include it with your message.